Vocabulary-rich activities and strategies for teaching the complex concepts students will need to understand in order to succeed in mathematics classes and beyond. In this practical guide, mathematics teachers get vocabulary-rich activities and strategies that target the important content objectives they already teach, and reflect the expectations of their state or the Common Core standards. The book’s 12 hands-on teaching units address three areas of study covered in a typical mathematics class or textbook—geometry, measurement, and numbers and operations—and cover such topics as lines, angles, and polygons; properties of quadrilaterals; measurement area, perimeter, and volume and fractions. Each unit provides specific directions, language, reproducible materials, supporting activities, and assessments to help teachers effectively and efficiently target the different types of vocabulary needed for academic success—domain-specific and general academic vocabulary and language—all centered on the content that teachers already teach. 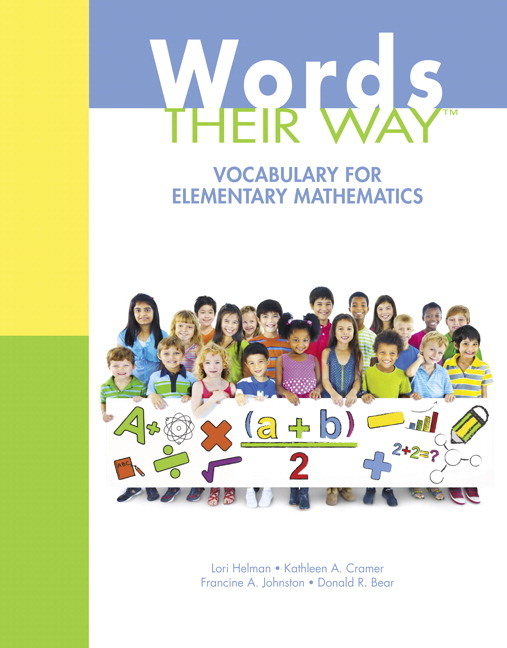 Aimed at fourth and fifth grade teachers, but also useful to others who teach units on geometry, measurement, or fractions, Words Their Way: Vocabulary for Elementary Mathematics does not seek to replace the classroom mathematics text, but instead serves to explicitly support the learning of academic vocabulary so that students will do better when they work in their basal or other materials. An outline of the crucial role of vocabulary in mathematics. Coverage of three essential types of vocabulary knowledge—domain-specific, general academic, and generative—and principles of vocabulary instruction. A guide to a set of core vocabulary activities featured throughout the text that teachers can use to engage students and build conceptual knowledge, help students find the patterns in mathematics, connect vocabulary to context, and assess content vocabulary. Advice and suggestions for teaching vocabulary in a generative fashion. Connections to Common Core Standards, or other rigorous state standards are made throughout the units. Scaffolding teachers’ instruction of vocabulary instruction is provided, including identifying important vocabulary, planning age-appropriate activities, and creating black line masters. Knowledge of generative vocabulary is built for teachers and students to help students see meaningful chunks of words and use them to learn and create related words that are important to reach high academic standards. Cognates in Spanish are included to help Spanish-speaking students make connections to their home language, and help monolingual English speaking students gain knowledge of other languages. Tips for multilingual students help teachers in linguistically diverse classrooms gain ideas on how to scaffold instruction to support all students’ needs. Interactive activities help students learn by sharing, doing, collaborating, and creating. The systematic series on instruction provided in each unit not only gives teachers specific lesson plans, but also lets them innovate on the format to use with other academic vocabulary in their curriculum. Lori Helman, PhD, is Associate Professor in literacy education in the Department of Curriculum and Instruction at the University of Minnesota and Director of the Minnesota Center for Reading Research. Her research investigates literacy learning and academic language development for elementary students. She works with teachers and administrators to implement continuous improvement in schoolwide literacy approaches. Dr. Helman is lead author of the Words Their Way with English Learners series. She also publishes books and articles related to literacy instruction and literacy development with multilingual students such as Literacy Development with English Learners (Guilford) and Literacy Instruction in Multilingual Classrooms and Dilemmas and Opportunities: Close Looks into Language and Literacy Learning for Linguistically-Diverse Elementary Students (Teachers College Press). Kathleen Cramer, PhD, is Associate Professor in Mathematics and Elementary Education in the Department of Curriculum and Instruction at the University of Minnesota and Co-Executive Director of the STEM Education Center. Francine Johnston, PhD, is Associate Professor Emerita from the School of Education at the University of North Carolina, Greensboro. She is a core author of the Words Their Way series. Donald R. Bear, PhD, is Professor in the School of Education at Iowa State University and Director of the Duffelmeyer Reading Clinic. He is a core author of the Words Their Way series.